An Upper Brookville mansion owned by the Russian government and targeted for closure by the Obama administration in retaliation for alleged Russian cyberattacks was shuttered Friday. “The premises have now been vacated,” Village Mayor Elliot Conway said after at least eight vehicles with diplomatic plates departed on a wooded hillside driveway to Mill River Road in the upscale North Shore village. The State Department declined to confirm Friday that the Upper Brookville house, owned by Russia for more than 60 years, was closed. A spokeswoman referred to a statement Thursday stating only that the “property is on Long Island and is 14 acres.” The Upper Brookville property is 14 acres, according to Nassau County records. Conway said the State Department told him the Upper Brookville compound was the property in question. The Upper Brookville property was one of two “recreational compounds” that the federal government ordered closed Friday. The other is in Maryland. “The State Department will secure and maintain the properties in keeping with our responsibilities,” the State Department said. The White House said the closing of the houses — along with the expulsion of 35 Russians from the United States and sanctions against Russian intelligence agencies — is in response to Russian hacking before the U.S. presidential election and harassment of U.S. diplomats in Russia. The Russian government denies that it hacked into computers to influence the presidential election. Tom Suozzi, the Democratic congressman-elect for the Upper Brookville area, said the Obama administration’s actions were appropriate. “It’s important that the United States of America act in as much of a bipartisan fashion as possible to send a very clear message that their cyberattacks or other inappropriate aggressive behavior is going to be met with countermeasures,” he said. Nassau County assessment records state the brick and stone house is a “Russian Federation Mission.” The house, with a market value of $9,350,400, has 36 rooms and an in-ground pool, records show. A Sept. 18, 1952, Newsday article on the purchase of the house, headlined “Reds Buy Second Little Kremlin on LI,” said the mansion was bought to house Valerian A. Zorin, the Soviet delegate to the United Nations. Alexa Roland, 22, who lives less than a quarter mile from the compound, said that when she was about 10 years old, her mother, curious about the mansion, drove up the driveway, which at the time had no gate. “Two men came out and they were armed,” Roland recalled. “They asked what we were doing and said, ‘We’ll have to search you. This is Russian property.’” The men searched the car, and Roland and her mother, and then told them to immediately leave, she said. Dan Travers, who has lived across from the compound for about 12 years, said he never noticed any “unusual activities” on the property. Travers said his only encounter with someone from the Russian property came about a year ago after his dog had walked across the street and spent the night against the compound fence. “Someone called us who didn’t speak English” and managed to communicate that the dog was at the house, Travers said. Spinello said little is known about what occurs at the Russian mansion in Glen Cove, which is known as Killenworth. 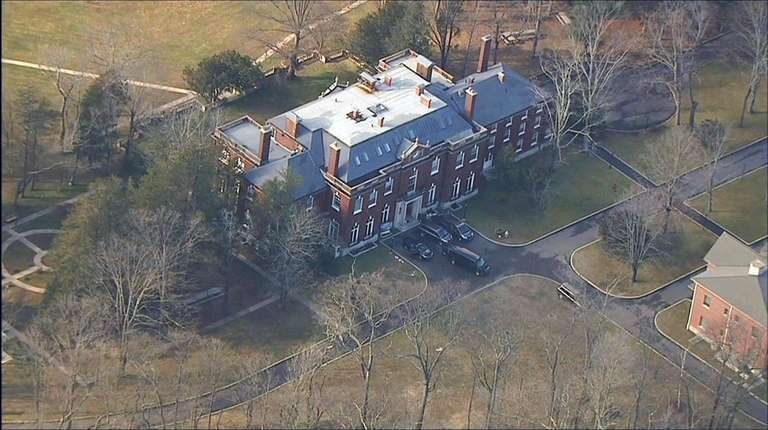 A diplomatic dispute occurred in the 1980s when Glen Cove officials, alleging the mansion was being used for spying, barred Russian officials from using city beaches and tennis courts, according to news reports at the time. That policy was later reversed. Spinello recalled that, when he was a child in 1960 during a time of tense relations between the Soviet Union and the United States, Soviet leader Nikita Khrushchev visited the Glen Cove estate.